Status Iatrogenicus: Speed Matters: Landmark Guided Left Subclavian Vein Central Venous Catheter Insertion & the "Deep Spot"
Speed Matters: Landmark Guided Left Subclavian Vein Central Venous Catheter Insertion & the "Deep Spot"
Recently, I got permission from a patient to video a subclavian line insertion. This patient was absolutely terrified of any line insertion as he had had many in the past and a lot of them had been traumatic, prolonged, and painful. I offered a bedside subclavian as an alternative to a PICC line or a right internal jugular in Interventional Radiology, promising that the entire procedure could be done in under 10 minutes. It took just over 2 minutes, excluding prepping, draping, locally anesthetizing, and suturing. These aspects would have added about another 3-4 minutes to the task. Before the video started, I had infiltrated the area generously with 2% lidocaine, after prepping and draping in the usual careful fashion. Before you watch the video, I should describe the essence of subclavian landmarking and several mandates of the procedure. The key anatomical landmark is a spot seen in the photo accompanying this post that I call "the deep spot." This is a spot along the inferior border of the clavicle, about 4 inches from the suprasternal notch (SSN). It is important because it is the spot where soft tissue adjacent to the inferior border of the clavicle can be depressed the deepest, allowing the needle the easiest access to the subclavian region while being inserted "FLAT, FLAT, FLAT, FLAT, FLAT" under the clavicle with respect to the ground, i.e., parallel to the ground. Entering the subclavicular region in this spot and remaining flat/parallel to the ground are keys to both success and avoidance of the oh-so-feared (but rare!) pneumothorax. This spot can be found by making the middle finger and the thumb of the non-dominant hand into a comfortable "C" shape as seen in the photo. The middle finger and thumb will be parallel to each other when in the "C" shape and will be about 4-5 inches apart depending on your fingers and the patient's anatomy. With the middle finger in the SSN, the thumb finds the spot along the inferior border of the clavicle where the skin can be depressed the deepest. If you're too medial, you will be atop ribs and "too high not deep enough" and if you're too lateral from the SSN, you will start climbing up the humeral head and deltoid and be "too high, not deep enough". If you are too close to the clavicle or atop it, you will not be in the "deep spot" (it is a finger breadth or so inferior) and if you go too inferior from the clavicle, you will climb atop the pectoralis/breast and not be in the deepest spot. Find the "deep spot"! Again, the point (no pun intended) is to find the spot where the tissues near the clavicle can be depressed the deepest to facilitate the insertion of the needle under the clavicle and parallel to the ground. This cannot be overemphasized, and you can feel for that spot on yourself or a willing companion for practice. Once this spot is located, you anesthetize and then use the needle to confidently identify the clavicle and by advancing the needle towards the SSN, you can press down with your thumb on the needle (even the part under the skin) to depress it so that when advanced, it is parallel to the ground towards the SSN and it goes easily under the clavicle. You should never "dive" to try to get under the clavicle, or use the clavicle as a fulcrum, bending the needle downward. Watch the video carefully to see how I'm using several tactile inputs to determine where the clavicle is as I guide the needle under it. You will see that the first several "pokes" or short advancements of the needle hit the clavicle (it happens fast, watch carefully!) which is a very important tactile confirmation of where you are, and then I push the inserted needle down with the left thumb to allow the advancement to proceed below the clavicle. As seen in the video, the SCV is often entered when the needle is maximally inserted ("hubbed") with the skin invaginating, or upon withdrawal. Notice too in the video that the flash was subtle at first and too rapid a withdrawal might have missed it. 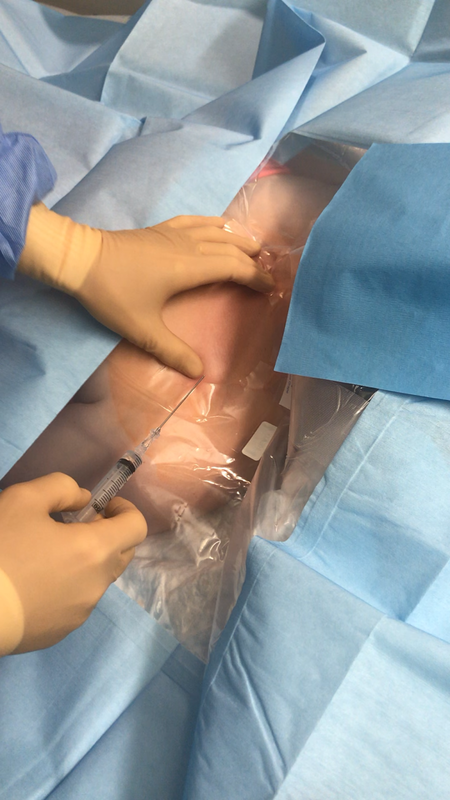 Also in the video, the flash was highly positional, and the exact optimal position had to be found by iterative advancement and withdrawal and then maintained by carefully pinching the hub of the needle with the hand referenced to the patient's chest to allow the wire to be fed without inadvertent and unrecognized migration of the needle out of the vessel. The voice overlay of the video gives several other useful tips and I hope you enjoy watching it. The SCV central line is one of the final remaining procedures where use of ultrasound guidance (USG) confers minimal, if any benefit, and USG markedly prolongs this (and all) procedures. Over my career during the past 20 years, I estimate I have done 500 or more SCV catheters all guided by landmark, most in critically ill patients. I had *one* pneumothorax (PTX), in 2011 in a patient with severe COPD. (I also supervised a resident once where there was a PTX, and to this day I don't understand how it happened.) In properly trained hands, this procedure is incredibly safe, is the preferred location for a central venous catheter in terms of patient comfort, and infection and thrombosis risks, can be performed with a very high success rate using landmarks alone, and can be done very speedily. Speed is the final frontier: Safety, Success, Speed. And here is a Right Internal Jugular HD Catheter insertion using landmarks by The Phlegmfighter (yours truly).